Compact but still has a full-size toilet seat. Requires less pumping action to flush unit. Extra large rotating waste spout. Respected brand of portable toilet. Waste and fresh water tanks are about half the size of the premium toilets on the market. Whilst this makes it compact, it increases the need for emptying and re-filling. Given its smaller capacity, its price point is a little high. The Dometic 972 is a very user-friendly toilet, made more appealing by its super compact size. It's a hardy unit, meaning that it can stand up well to the impacts of outdoor life and will stay in good condition for many years. 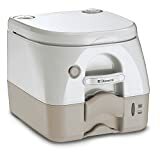 In terms of value for money, there are better models around, but if portability and size are key buying decisions, then this portable toilet is still a very good choice. This Dometic portable toilet is a great product for camping, RVing and for use on boats. Made from ABS plastic, the styrene gives the toilet a shine and makes it easy to keep clean, whilst other chemicals protect it from difficult weather conditions, particularly low temperatures. Easy to view tank level indicator. Push button flush. No batteries or constant pumping required. A simple design but a stylish looking unit. With limited parts that can wear out or break, it’s a reliable portable toilet to buy. Toilet lid is securely fastened to the base with a latch. Being a compact unit, it can be easily transported in smaller vehicles. Both upper and lower tanks have robust handles to make carrying it easier. The handle for the upper unit is on the front and on the back of the lower holding tank. It has a rotating waste spout. This means that the actual distance between you and where the waste empties from is increased, therefore reducing the opportunity for splashing. An additional kit may be purchased to fix the toilet to the floor, in areas like RVs where you don’t need it to be completely portable. A replacement waste tank may also be purchased for those who want a little extra backup security. 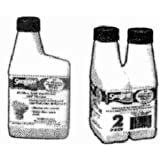 Tank capacity: Waste tank – 2.6 gallons and fresh water tank 2.3 gallons. The ABS plastic composition helps to protect the toilet from corrosive materials and is resistant to hard physical impacts, making it a hard wearing unit to have in outdoor environments. The push button flush means it is simple to use, with no manual pumping required each time the toilet is used. 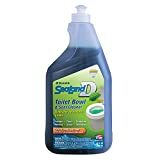 This increases convenience, reduces mess and with a powerful flush, it helps to keep the bowl clean. The push button flush system does, however, operate using water that has been pressurized first. To pressurize the water, a hand pump is used first. The hand pump is located on the top left-hand corner of the toilet. Pulling it up and down 10-15 times should be enough to pressurize the water. Alternatively, once you can feel air coming out of the relief valve, on the top right-hand corner of the unit, it should be ready to go. The relief valve is on the top of the water tank cap. The water tank can be filled via the water cap on the top of the toilet. The cap is a screwcap, so can be simply screwed on and off when needed. Even though this is a smaller toilet, the robustness of the ABS plastic and full-size seat makes it perfect for adults. It is easy to keep an eye on the waste tank via the tank level indicator on the front of the toilet. The toilet has a handle at the front, which is easy to pull out before and after using the toilet, or before and after emptying the waste tank. Pulling out the handle opens the sliding cover that separates the bowl from the tank underneath. Pushing it back it closes it up again. The handle should always be pushed in, and the valve closed after use and when in transit. It should also be closed when emptying the tank. The compact and sleek design of this toilet makes cleaning it very easy. The lid and toilet seat may be easily lifted up and cleaned around and the bowl is free of crevices. Both the top and bottom parts of this toilet may be separated. The upper unit contains the freshwater whilst the bottom holds the waste. A latch at the rear keeps the two parts connected when in use. When emptying is required, the latch can be removed and the two units simply come apart. The Dometic 972 portable toilet comes with a one-year warranty. When pressurizing the upper water tank, make sure it is connected to the bottom part of the toilet. Do not attempt to pressurize it whilst separated. Use disposable gloves when handling the waste tank. As the warranty does not cover damage you might do to the portable toilet, it is advised to use the recommended products. Dometic recommends using SeaLand Cleaner, but if this is not available use other cleaners recommended for portable chemical toilets. 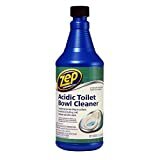 It is advisable to never use rough cleaners, pastes, scourers or acids on any of the toilet or toilet parts, especially the valves and seals. Using the recommended products also helps to keep all parts properly maintained.